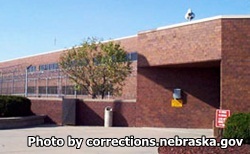 Nebraska State Penitentiary is located in Lincoln Nebraska. It was first opened in 1869 making it the oldest prison in the state. It currently is a mixed custody facility housing minimum, medium and maximum security adult males. The current population at this facility stands around 1100 inmates. While incarcerated at Nebraska State Penitentiary offenders are encouraged to participate in the educational, vocational and therapeutic programs offered. Inmates can earn a GED, take college courses, and receive an adult basic education. Parenting courses, substance abuse treatment, and mental health counseling is also available. This prison also participates in the Cornhusker State Industries program allowing inmates to work in furniture production, metal fabrication, laundry, soap and detergent manufacturing, and license plate production. ​Thursdays from 8am-12:00pm, 1:00pm-4:30pm, 5:30pm-8:30pm. Saturdays from 8:00am-12:00pm, 1:00pm-4:30pm, 5:30pm-8:30pm. For more information on visiting hours visit the Nebraska State Penitentiary visiting hours page here.